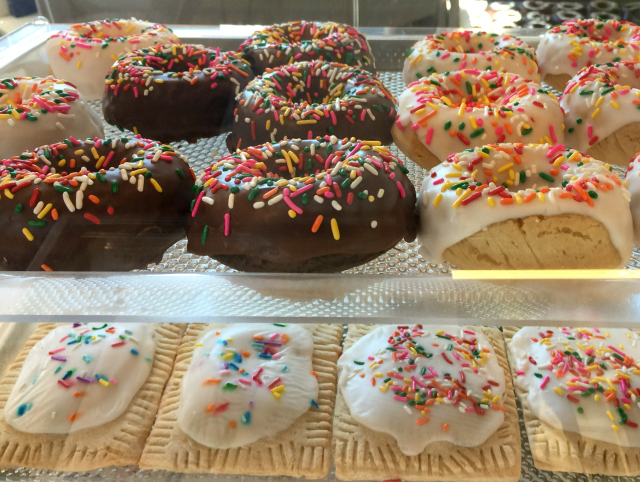 Donutology in Kansas City is now offering gluten-free donuts and toaster pastries! Cooked in the dedicated and certified gluten-free kitchen of Emily Kate’s Bakery, Donutology currently offers three varieties of donuts: Chocolate with chocolate glaze and sprinkles, Vanilla with vanilla glaze and sprinkles and Lemon Blueberry. There was also one toaster pastry offered, a mixed berry with vanilla glaze and sprinkles. All of the gluten-free offerings are in their own little display case sitting atop the bakery counter nearest the register. The lovely lady who packaged my order put gloves on and handled my order very carefully. I felt like everything they could possibly do to make certain the donuts retain their gluten-free status is being done here. About the donuts: the chocolate was very cake-like, almost like a cupcake. The vanilla tastes like a combination of a sugar cookie and a donut. A sugar cookie donut, perhaps? It’s lovely. The lemon blueberry may be my favorite of the three, even though that’s not usually a favorite flavor combination of mine. Slightly tart, plenty blueberry-y. 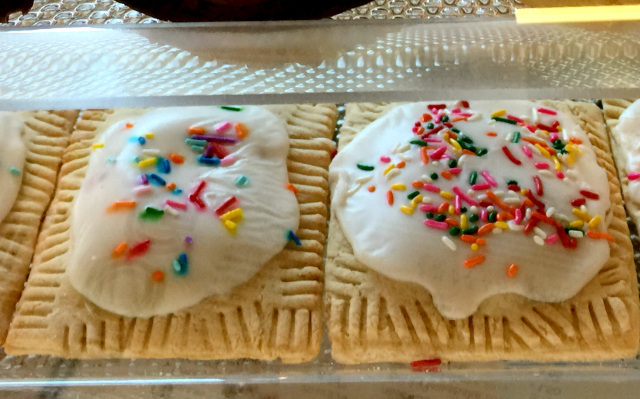 About the toaster pastry: THIS is a gluten-free poptart. I know, I know, they can’t use that name, but that’s what it is. Except better. The frosting is nice and the mixed berry filling gooey and sweet and in perfect quantity to go with the crust, which is somehow very much like I remember the kind in a box. 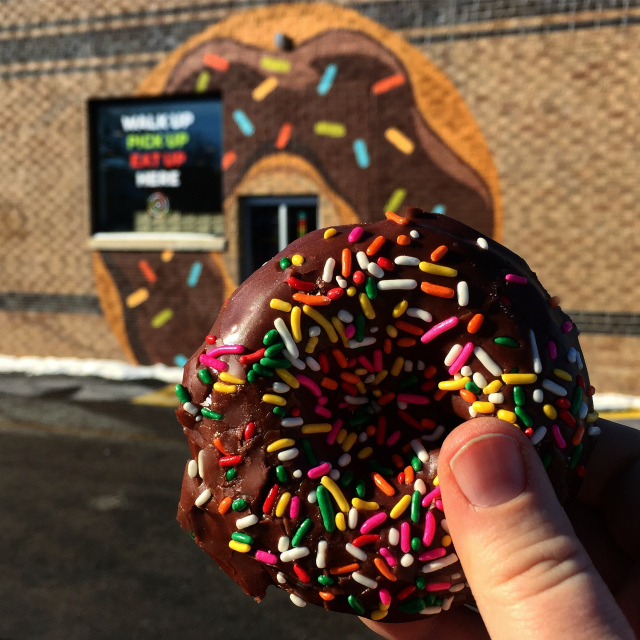 If you’ve followed my site from the beginning, you know donuts led me to writing about food (52 donut shops in a year!) and then celiac disease tried to break us up. It’s been a long time since donuts were a safe possibility at most donut shops. 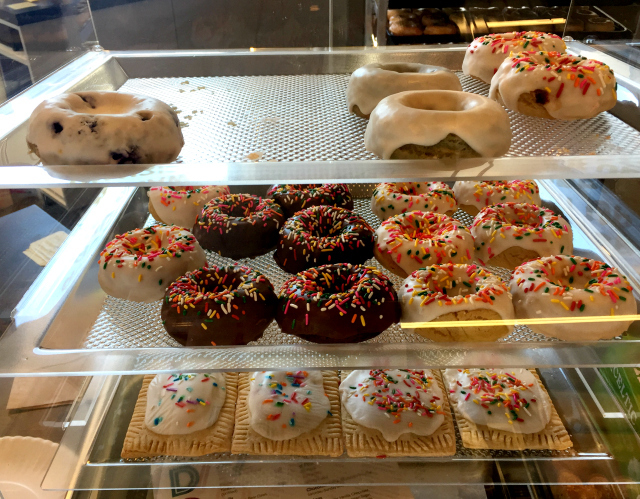 I’m thrilled to finally be able to visit a donut shop in my own city that has gone the extra mile to make gluten-free donuts a possibility! Donutology is located at 1009 Westport Road in Kansas City, Missouri. 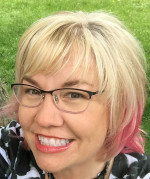 816.298.5222. Parking can be a little tricky, but there is plenty of parking across the street in the Westport Landing shopping center; just be careful crossing the street as folks aren’t accustomed to pedestrians making a mad dash for donuts there. Not yet anyway. My travel and dining series is not intended as a review, rather a summary of my experience. * Menu prices, items and ingredients featured were current at the time of writing. Please read the menu carefully and ask for assistance in ordering if you have dietary restrictions. It’s a good idea to call ahead and let the restaurant know of your food needs. *Writing bad reviews doesn’t feel good. Only in extreme cases (a total of two in six years) where gluten has been apparent in my food or the handling of my food restrictions was of great concern do I share anything less than a recommendation. I’d rather share a good recommendation with you. I hope that’s what you are looking for anyway, recommendations on where to dine and fun places to visit in your travels. Thanks for understanding.